I had the pleasure of visiting the BP Portrait Award 2017 Exhibition at the National Portrait Gallery and as ever it was a delight. I try to go this exhibition every year as it showcases a real depth and variety of artistic styles and interpretations of portraiture. In its 38th year, there were 2,580 entrants this year – including myself however I unfortunately didn’t get shortlisted (next year maybe!) – demonstrating the best in contemporary portraiture. Here are my list of personal favourites, a controversial entry and the dark horse. Note, all the opinions are my own. This was my favourite painting which can be found in the corner in the first right as you enter the exhibition. It’s somewhat dwarfed by the large canvas of “The Levinsons” next to it. There are several reasons why I like this painting. First and foremost is the expression on the sitter’s face. Every time you look at it you’re confronted by a different emotional response with the same facial expression. It could quite easily be an expression of fear, anxiety, despair, or more optimistically contemplation, calm, or serenity. The clasped hands and the crossed leg contribute to this emotional ambiguity and a sense of underlying unease. I don’t think the sitter is comfortable at all. 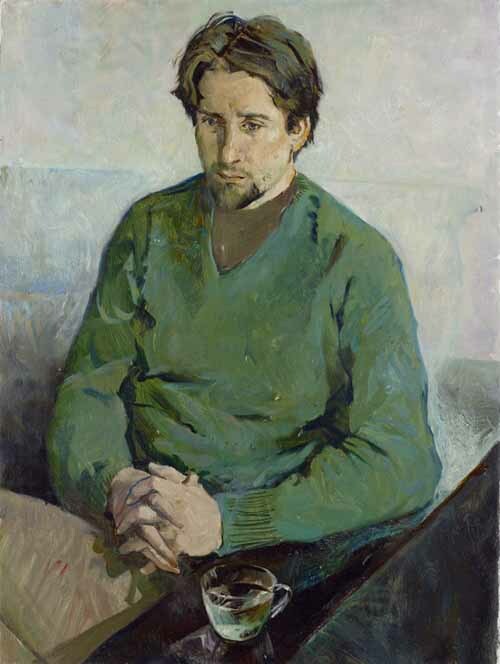 The contrasting green jumper against the neutral grey-blue-black background creates the impression that there is a burden on the sitter’s shoulders. The face is beautifully painted and I love the artist’s attention to texture in the jumper. The cup of tea, in the foreground could possibly represent China, although I’m not sure entirely and this is purely a guess. There is nothing else in the composition to suggest the sitter is in China except the title. The artist has deliberately not named this person which is another interesting decision. It’s noted in the description that this was the artist’s lover and I would guess the decision not to name him is deliberate to reinforce the message that this person is merely a memory. This was a large painting found in the second room at the exhibition in the back left corner. The medium is acrylic on linen and was it is apparent is the hurried nature of it. 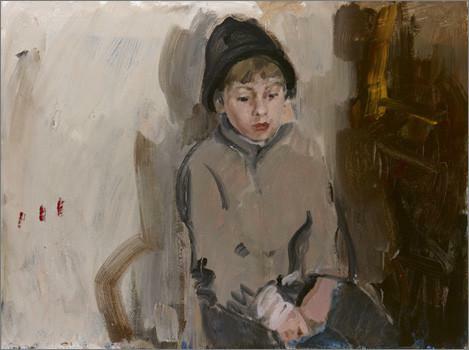 The background and clothing appear to have been painted with few, visible brushstrokes. It looks as if very few brushstrokes were used to actually convey the posture and hands. What I liked about this painting is the contrast between the calm, contemplative sitter and the frenzied nature of the background. This almost magnifies the serenity of the sitter. You are drawn to the soft expression that grounds the painting and draws your attention to it. The style is impressionistic and I find the marks and brushstrokes beautiful. 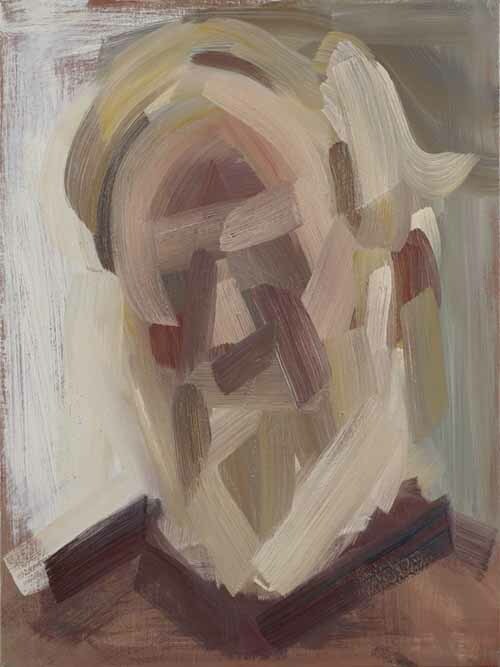 This painting, comprising of bold brushstrokes of various tonal grades appears to depict an abstract form of portraiture. There is little to no attempt at even painting the surface anatomy of the face. Even from a distance you can perhaps just about make out a face but I wasn’t overly convinced. You get absolutely no sense of the sitter’s facial expression and I struggled with this. The brushstrokes allow the outline of the face to be recognised and I like the nose but I was left somewhat at a loss. A future debate will probably consist on how you define a portrait (there was another painting in the exhibition featuring just an ear!). This painting was memorable by being almost an anti-portrait and left me feeling irked. 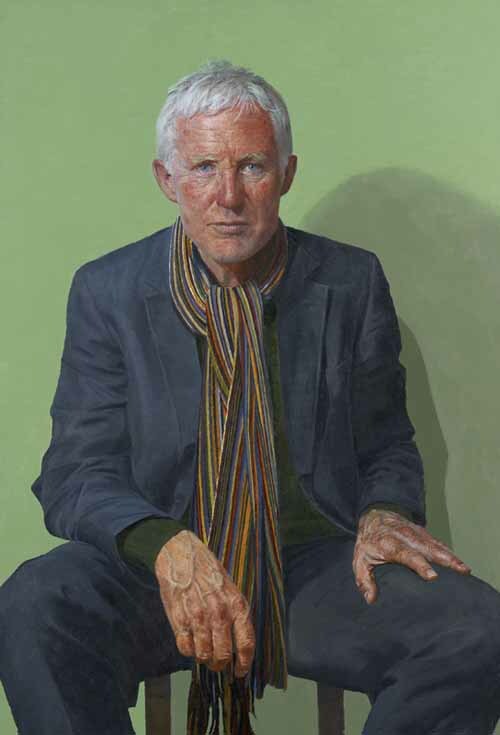 My final favourite painting was that of Norman Lamb MP by the artist Paul P. Smith. What struck me was how the hands and scarf were painted. the hands are painted with near-realistic anatomical accuracy to the point where I was staring at the blue-green veins and wondering how easy they would be to insert an intravenous line. The precision in which the scarf is painted with uniform lines is breathtaking however I wouldn’t say this painting is hyperrealistic like some of the other artists in the exhibition. This painting is a wonderful example of how when clothing and hands are painted well they are very satisfying to look at. Overall I thought the exhibition was absolutely brilliant and I would urge as many people as possible to go (it’s free!). I think I will try and enter again next year…!